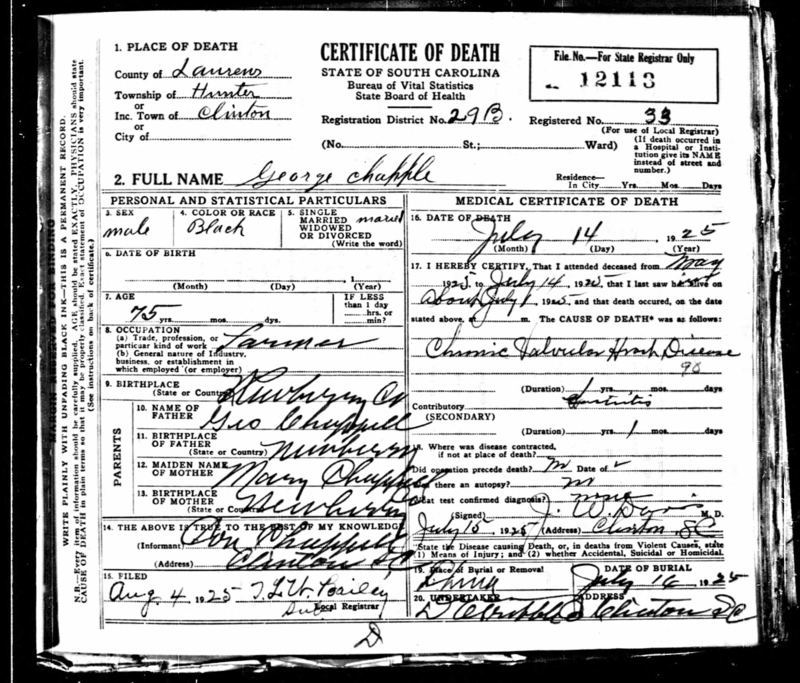 We have been looking for George Chappelle ( -1925) in pre-1870 documentation. 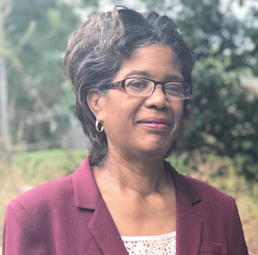 If you read last week’s post “Can Historical Newspapers Help Me Determine My Freedman Ancestors?” you will remember how Jan Mitchell-McDermott has been helping me find records for the ancestry of Cora Lee Chappelle Vance. She has come up with a lot this week, and I want to make sure you are able to follow along. Knowing that George Chappelle died in 1925, we decided to take a close look at the 1920 US Census to determine if he might have left any land or property. Many researchers do not even bother to look especially since he was born in the 1870’s. Here we see that George Chappelle, 68 has remarried to Mary, 41. His first wife Carol Adams Chappelle died March 29, 1917. An adopted son, Thomas, and two grandchildren are living with them. The oldest grandchild is believed to be Lafayette Vance, child of Andrew and Cora Vance. In the sixth column, the O stands for home owned. In the seventh column, F stands for owned free. There should either be a will or probate as a result of George’s death. “South Carolina Probate Records, Files and Loose Papers, 1732-1964,” images, FamilySearch (https://familysearch.org/ark:/61903/3:1:939L-FN93-NK?cc=1911928&wc=MPPG-W36%3A190568901%2C194944001%2C190568902%2C190560104 : 21 May 2014), Laurens > Probate Court, Index to estate papers > 1800-1931 > No File Description Available > image 35 of 144; county courthouses, South Carolina, and South Carolina Department of Archives and History, Columbia. I look forward to learning more about Thella (sp) and Conway and any other children. Land records could also be available. Probate records and land records are housed in the same place, so I will search for land records also. Have you used the census to determine which ancestors may had have land or property at their time of death? If not, go through each census between 1940 and 1900 to determine ownership. Check probate and wills for the area on the Research Wiki. If the records are not available on FamilySearch.org or Ancestry.com, call the county courthouse to order or see the record. Share your favorite finds in our Facebook Group.